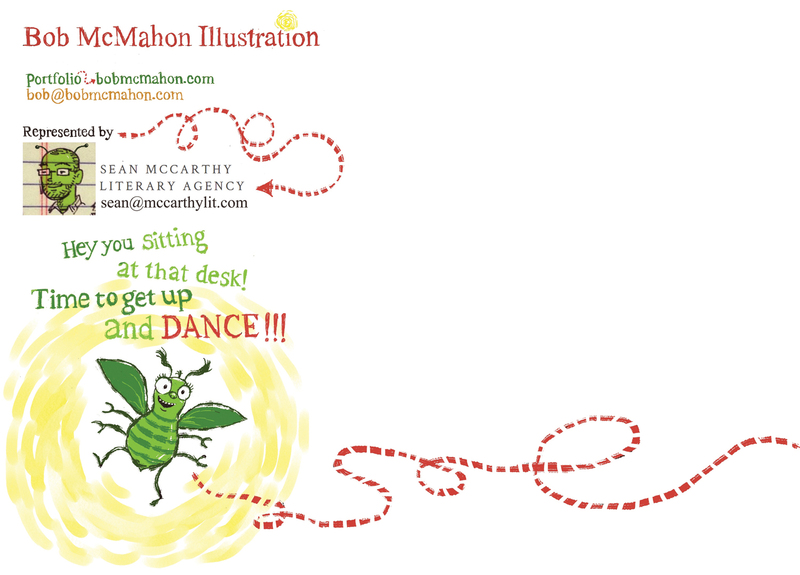 The Postcard Post welcomes illustrator Bob McMahon. 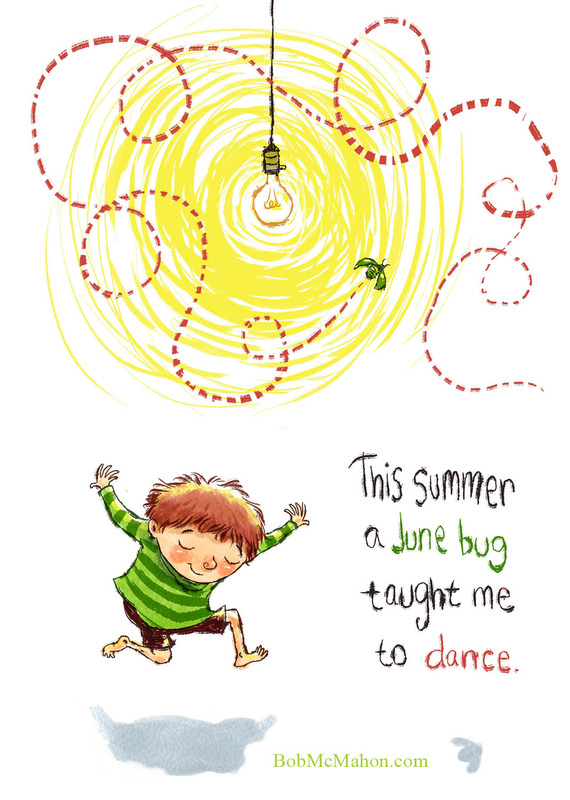 Get set for some self-promotion tips and fun illustrations. Bob McMahon has been doing all sorts of illustration over the past twenty plus years from licensing, advertising art, movie posters and children’s books. He’s done books for Tricycle Press, Kar-ben and Scholastic publishing. 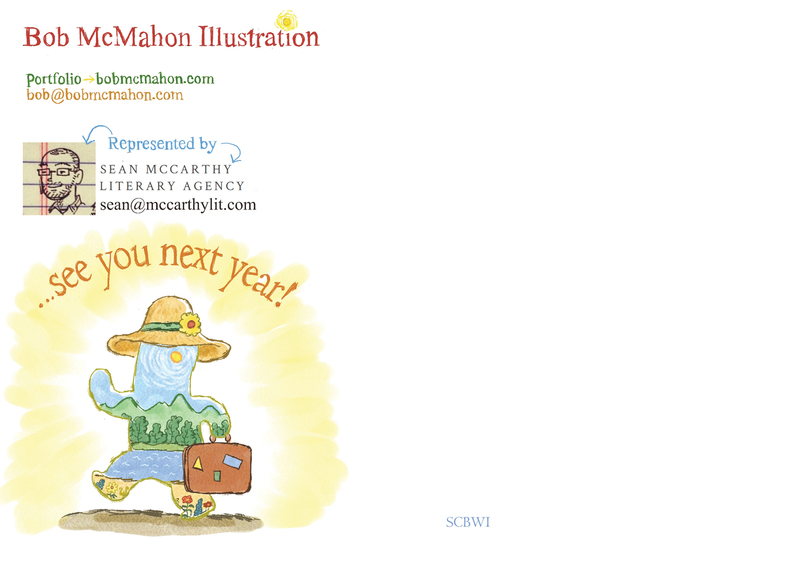 Currently Bob is writing a children’s book and is represented by Sean McCarthy Literary Agency. I try to create the image with the intention that this is the kind of work that I want. I also like to do a little mini-story that I can tell on both sides of the card. I’ll maybe have a little text on the front of the postcard if it’s relevant. I think the picture should tell the story on the front though and also a smaller picture on the back that continues the story from the front. The story continues (come back!). And contact info is included on the back of the postcard. Yes. I want to create something new, try out new ideas or maybe a new style. Art directors and editors are really busy people and they get inundated with promotional cards etc. so I figure that once they pick up my card I have only about two seconds to get their interest* so I really try to put something unique and fun on that card. *That’s the truth! Postcards have to grab them fast! Mine tend to be stand-alone pieces. They might mention the seasons or some holiday that the mailing coincides with but mostly their a one-off piece. I try…the emphasis on TRY* to send out postcards 4 times a year but if I’m caught up in a big project I’ll only do it three times a year. *Ha! We hear that a lot. Three times a year is still pretty darn good. I compile my list from the SCBWI “The Book” that has a wonderful list of editors and art directors that work in the children’s book and magazine field and also I have some contacts that I picked up through the years in advertising and other fields. I use to send out 1500 cards at a time* but I realized that was too expensive and it wasn’t getting me anywhere so I reduced it down to just the 350 companies and people I want to do work for. * Wow! The post office must have loved you! *Use the comment section, dear readers, if you have a suggestion! I do my all artwork in Corel Painter and also the apply the type in Painter too. I find it easier to use than Photoshop, probably because I’ve been using Painter for so long I’m use to all its quirks. Since I create the image exclusively for the postcard, I make my art 5.1”x 7.1” for a 5×7 postcard. After I get the art and the type the way I want it, I then save the front and back of the card in Painter as a JPG and open it in Photoshop CS5 and convert it to CMYK* and then upload to my printer. *Converting to CMYK is an important step that people sometimes forget and are then disappointed with the quality of printing. Ha! This is hilarious. I hope at least a few art directors took that bug’s advice. My favorite place to get my postcards printed is GotPrint. It used to be that only a few places did a decent job of postcard printing but now there are a lot of really good printers so for me the decision comes down to price including shipping. GotPrint is close to where I live so the shipping charges for next day delivery are very cheap. Thanks so much for sharing such helpful information and fun illustration samples, Bob. Thank you for the interview and the tips. The illustrations are so funny and refreshing! 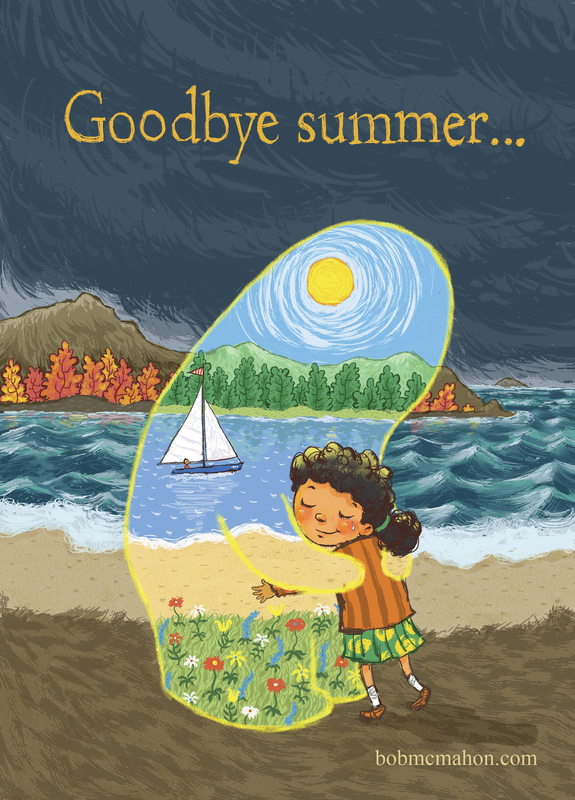 Oh my gosh I just love those Goodbye Summer illustrations. I’d love to see a book with that character! Thanks so much for the great interview Bob. I agree with Heather. That image just grabbed me. It is so poignant and loving at the same time. Amazing job, Bob.